The Indian economy moves with the help of tax. The tax collected from the citizen is used to build roads, hospitals, school and to provide other amenities to the general public. It is the core foundation of the Indian economy eventually. The tax collected from resident or non- resident it doesn’t make any difference to its end use. 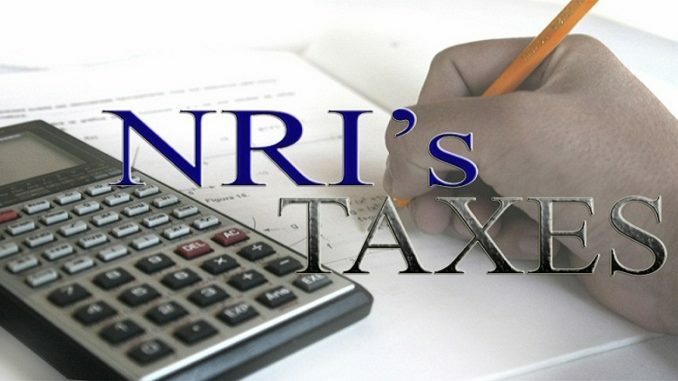 Today, in this article we will throw some light on the Income tax for NRI. To know about Income tax for NRI first we need to check the residential status of the person whether it comes in resident or non- resident. How to check the residential status? –	If a person is in India for 2 months (60days) for the year in the previous year and have lived for one year i.e. 365 days in the last 4 years. However, of a person is an Indian citizen working abroad or a member of a crew on an Indian ship, then in that case , only the first condition is applicable which means that a resident is called as resident if it is India for 182 days. Furthermore, it is also applicable on the Person of Indian Origin who is on a visit to India. The second condition is not for these individuals. A Person of Indian Origin is a person whose parents or any of its grandparents were born in undivided India. Hence, if a person doesn’t meet any of the above condition then it is known as the Non- Resident of India. What incomes are included in the NRI’s income? Now, talking income tax for NRI in India is according to the Income tax. NRIs income taxes in India completely depend upon its residential status for the year. If the status of the person is “resident” the income earned globally is taxable in India. The income tax for Indian residents working abroad is same like they are in India. They are still accountable for paying tax. The above- mentioned examples are that comes under Income tax for NRI. Income earned outside is not taxable in India. Interest earned on an NRE account and FCRN account is completely tax – free although Interest on NRO account is taxable for NRI people. Should NRI are required to file Income tax Return? Yes, Resident or non- Resident of India, any individual whose income exceeds Rs 2, 50,000 required to file its income tax return in India. The last date to file Income tax return in India is 31st July for Non- Resident of India. In case, the tax liability exceeds Rs 10,000 in a financial year then the person is required to pay the advance tax. Furthermore, the interest under section 234B and section 234C is applicable when the person doesn’t pay the advance tax. File your Income tax return now! What is Taxable Income for an NRI? The taxable income is income that a person earned by the way of salary, profit or other income. The salary you receive in Indian or by any other person on your behalf is taxable in India. Therefore, in case of NRIs, the person receives salary directly into an India account then it will be subject to Indian tax laws. The Income tax is taxed according to the slab rate the person belongs to. The income earned from salary is considered as taxable if the services are rendered in India. So, in case you are an NRI and your salary is paid towards the service provided by you in India then it shall be taxed in India irrespective of the factor where you are getting the income. Furthermore, in case your employer is Government of India and the person is citizen of India rendering service outside India is also taxed in India. The income of Diplomats and ambassadors are exempted from tax. For example- Mr. Rohan was working in Canada on a project from an Indian company for a period of 5 years. Rohan needed the salary in India to take care of the needs of his family and make payments towards a housing loan. However, since salary received by Rohan in India would have been taxed according to the Indian laws but rohan decided to receive it in china. Income earned from a House property situated in India comes under the category of income tax for NRI. The calculation of the income shall be in the same manner as it for the resident. The property could be rented or lying vacant. An NRI is allowed to claim the deduction of 30%, or can deduct property taxes and can also avail the benefits of an interest deduction if there is loan taken for home. The Non Resident of India has also allowed having deduction for the principal repayment under section 80C. In addition to that, any stamp duty and registration charges paid at the time of purchase of property can also be claimed under section 80C. Income from house property is taxed according to the income tax slab rates. Sunita own house property in Chandigarh and has rented it out the property while she lives in Thailand. She has directed the tenant to make rent payments to be received directly in her bank account in Bangkok. Sunita’s income from this house which is in India shall be taxable in India shall be taxable in India. A tenant that lives in NRIs house and paid rent to the NRIs owner shall remember to deduct TDS at 30%. The Income can be transferred to Indian account or the NRIs account where he is currently residing. This rental income of NRI raises the liability of Income tax for NRI. For example- jiya pays monthly rent of Rs 30,000 to her NRI landlord. She is obliged to deduct tax at 30% for TDS or Rs 9000 before transferring the money to the landlord’s account. Jiya must also get a form 15CA prepared and timely submit to the Income tax department online. Any person making a remittance to a Non- resident India needs to submit Form 15CA online that is duly certified by the Chartered accountant detailing the exact payment, DTAA if applicable, TDS Rate and TDS deduction as per the Income act under section 195.
a)	Remittance doesn’t exceed Rs 50,000 in single transaction and Rs 2, 50,000 in a total financial year. In that case, only Form 15 CA is required to be submitted. c)	If the transaction falls under the Rule 37BB of the Income tax act, where the item are listed in 28 parts. The next income that comes here is the income from other source. Any interest income received from fixed deposit and saving accounts held in Indian account is taxable in India. Interest on NRO account is completely taxable. Any business or profession who is owned or controlled or setup by the NRI is owned to pay the Income tax. The NRI is liable to pay the Income tax. Any capital gain earned at the time of transfer of capital asset situated in India shall be taxable in India. Capital gains earned from any investments in India through investing in shares, securities shall also be taxable in India. If a person sold the house property and have a long-term capital gain, then in that case the buyer shall deduct TDS at 20%. However, a person who sold the property are allowed to claim capital gains exemption by investing in a house property as per Section 54 or investing in capital gain bonds as per Section 54EC. What are the special provisions related to investment income? Whenever, the NRI invests in any kind of Indian assets then he is taxed at 20%. If the special investment income is the only source of income then the income earned by the NI during the financial year, where TDS has been deducted then such NRIs are not required to file an income tax return. What are the Special Investment vehicles that qualify the special treatment? There is no deduction allowed under section 80 while calculating investment income. How NRI will file Income tax return in India? Any person or Non- resident of India can file the Income tax return by accessing the official site of Income tax department or let us help you in that. We at corpbiz have the finest track record of filing the tax liability for resident and non- resident of India. 1.	Who is considered as Non- resident Indian? However, if you do not satisfy any f the above mentioned conditions then you will be considered as an NRI. 2. Mohan is an NRI aged 65 years. Do mohan need to file a return even if the gross total income is Rs 2.8 lakh during the year from India? The basic exemption limit for filing the tax is Rs 3 lakhs and Rs 5 lakhs and only available for resident senior citizens and resident super senior citizens. Hence, being an NRI in case you are a senior citizen, then the moment your income in India exceeds Rs 2.5 lakhs, you will be liable to file your Income tax return in India. 3. Will a NRI will be subject to pay tax In case he sells a flat in India and earned capital gains tax? Yes. A NRI is liable to pay the tax when there is any income from capital gains tax in India by selling the property or asset. Further, the purchaser himself must deduct taxes on the quantum of gains the NRI make. The rate of tax deduction for a long term asset would be 20% while taxes at slab rates would be deducted at source if the asset is a short term asset. 4. When should an NRI file the Income tax return? An NRI same like the other tax payer needs to file his/her Income tax return in India if the total gross income received in India exceeds Rs 2.5 lakh for any of the financial years. Furthermore, the due date for filing the Income tax return for a Non- resident of India is 31st July of the assessment year. 5. What are the Income tax slab rates for F.Y 2018-2019 for an NRI? The Income tax slab rates for financial year 2018-19 for an NRI or other residents are discussed in our article Income tax slab rates 2018-19. Kindly read!